Mumbai: Distinguished social institution, ‘Ekata Manch’ and ‘Children Welfare Center High School’ successfully organized a colossal and grand ‘Free Health Checkups, Cancer Detection Camp and Blood Donation Camp’, which included cancer and blood donation drive on 14th April, 2017 at Children Welfare Center High School, Yari Road, Andheri (West), Mumbai. More than 150 doctors from Seven Hills Hospital, Raheja Hospital, B S S Hospital and other government hospitals were present and examined more than 2000 patients.In this camp, eye checkup and distribution of spectacles, blood tests, sickness related to children and women, dental checkup, ENT (ear, nose and throat), ECG,Skin checkup,Gynaec checkup, cancer tests and various other ailments were examined free by different doctors. Also a blood donation drive was held. 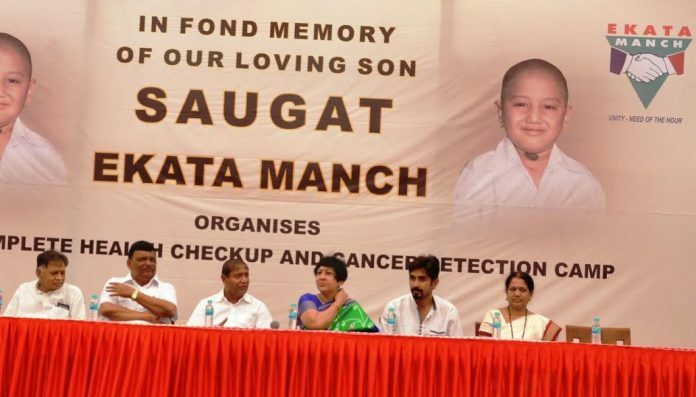 Dignitaries like Dr. Bharati Lavhekar (BJP MLA of Versova constituency, Mumbai Suburban), Prabhag Samiti President Yogiraj Dabhadkar, Ward-59’s Shiv Sena Corporator Pratima Shailesh Khopade, Ex (Earlier) Standing Committee Chairman Shailesh Phanse and many others made their presence felt.